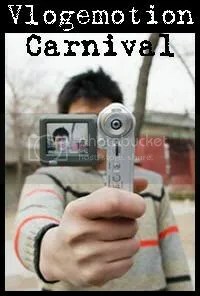 This video carnival, aptly named Vlogemotions (get it? Video + blog + emotions = Vlogemotions) focuses on one specific emotion per week and is brought to you by Fort Thompson. (Sorry this is so long. I had no idea it was six minutes!! But it felt good to talk it out and get my frustration out so … if you experience anything similar, please let me know! I’d be interested in hearing how you handle the times you’re incapacitated. Thanks for listening!). Reminder: Don’t forget to enter the photo contest!! You have until 4:00 p.m. CST July 18th! You don’t have to have a blog to enter the contest, post your picture to your photo hosting account (like Flickr — but not Facebook, please), and leave the link to your picture that way. You’re going to post those pictures anyway, why not enter it in the contest for a chance to win a $25.00 gift certificate? !